We reviewed the Pivos AIOS HD Media Player earlier this year. At the time, the AIOS HD was the first product from Pivos. One of our big issues with the AIOS HD was the limited selection of apps, particularly for major streaming services. For a follow-up to the AIOS HD, Pivos has come out with the XIOS DS, an Android-based media streamer with a motion sensing remote control. With Google Play at its disposal, the XIOS DS should offer up a lot more options for app lovers. 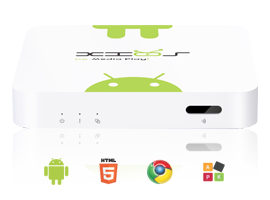 Pivos has also been working closely with the XBMC team to ensure that the XIOS DS plays nicely with the Android version of XBMC. If nothing else, the XIOS DS offers an unusually bright paint job. The idea from Pivos is to make the XIOS DS Media Play! a unit that won’t replace the smartphone in your pocket, but with this device there is a seamless transition from the phone while you are on the go, right on into the couch for catching up while you eat dinner or lounge around the house. Of course this media box doesn’t make phone calls, but with all the apps that come on the XIOS DS from Pivos and the huge Droid Marketplace, there really isn’t much you can’t find to do with this unit.